Tollerton originally lay within the boundaries of the royal forest of Galtres and is mentioned in the Domesday Book (1066). The royal Forest of Galtres was established by the Norman kings of England in North Yorkshire, to the north of the county town of York. Much of the land around Tollerton was owned by the Archbishop of York. In 1256 King Henry III granted John Mansel, Treasurer of York Minister a charter to hold a weekly market and an annual fair to be held on August 14th, 15th and 16th. Kings Edward I and Henry VIII confirmed this charter and an annual fair has been held each year until recently. The name may have originated from the village being located at one of the entrances to the great forest where travellers paid a 'toll' for which they were provided with an armed guide to protect them as they travelled on to York. First or last did like content me." It is believed that the tree on the green was planted to celebrate Queen Victoria's Diamond Jubilee in 1897 and some of the pictures of the green on this site date from 1904 and show it as a young sapling. The village had a small Railway Station until the 1960's and still has a pub called the Station Inn. In Saxon times, Tollerton was part of the administrative area known as the Wapentake of Bulmar, most of which lay within the boundaries of the royal forest of Galtres. According to Gill in his Vallis Eboracensis, published in 1852, the forest was a famous place for the hunting of wild boar, wolves and bears by both ancient British and Saxon kings. In fact, Gill surmised that the old name for York, Eborwic, was probably derived from Ebor (Saxon for wild boar) and Wic (refuge or retreat), the whole signifying a place which was a refuge from the wild boars in the Forest of Galtres. Gill carries on by quoting Geoffrey de Monmouth regarding a battle in around 400 BC when the Britons routed the Norwegians in the Forest. By the time of the Domesday survey, Tollerton was a township within the parish of Alne and 8 caracates of land belonged to the Archbishop of York. A carucate was as much land as could be ploughed by one team in a year and varied from 120 to 180 acres. In 1256, King Henry III granted John Mansel, Treasurer of York Minster, and his successors, the charter to hold a weekly market and an annual fair in Tollerton, the fair to be held on August 14th, 15th and 16th. Kings Edward I and Henry VIII confirmed this charter and the fair persists to the present day as the Tollerton Horticultural Society Show. There are numerous items on record regarding 'Old Tollerton' and at one stage a Village Newsletter was distributed quarterly. An enclosure map of 1817 records all the land-owners in the village. The 1851 Census shows that the village had 1 schoolmaster, 4 innkeepers, 4 shoemakers, 3 tailors, 3 corn millers, 2 grocers, 1 butcher, 1 chemist, 1 blacksmith and 1 cooper. Tollerton cattle market was held behind the site of the Tollerton Arms (which now is a group of 5 houses). 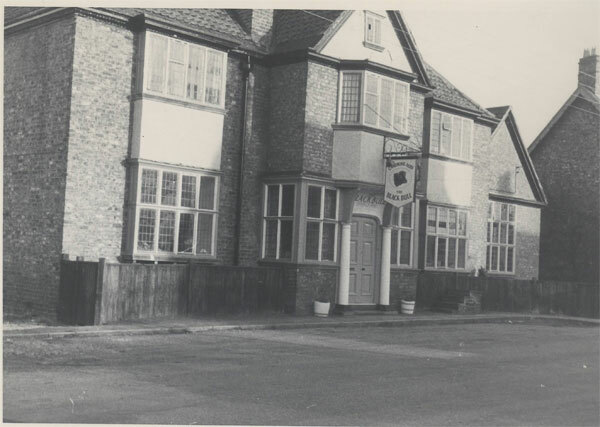 The village origninally had 3 inns, but the Tollerton Arms (Black Bull) pub was closed and demolished to make way for housing, as were White House Farm buildings. Cyril B Haworth Tollerton 1996 , with additions by Mrs Helen Crooke 2000 and Ian Jackson 2015.